If you're looking to bring a sophisticated, contemporary look and feel to your outdoor living space, then our dark grey decking is just what you need! These beautiful, modern composite deck boards are a bold option for any homeowner looking to create a current and trendy deck design for their outdoor space. Our dark grey decking provides an alternative option from authentic wood-style grain by combining a modern appearance with a traditional timber feel - perfect for all tastes. Our dark grey decking has the scope to produce spaces of true beauty and style, that need practically zero maintenance requirements! Thanks to their revolutionary composition, you are able to spend a greater amount of time appreciating and enjoying your deck and less time to look after it. To see an example of the stunning outdoor living space you can create using our dark grey decking, take a look at our showcase video here! Due to its revolutionary make-up, you will never have to worry about our dark grey decking rotting or warping. A great alternative to natural wood and plastic decking that requires no staining, painting or sealing! 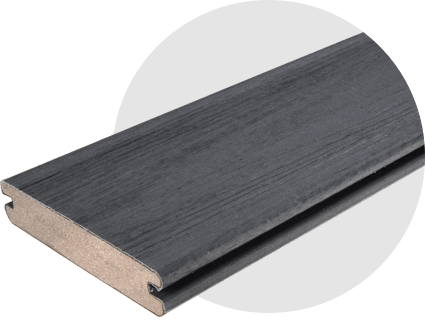 Created with 73% recycled materials which includes natural hardwood and a polymer resin, our dark grey decking is incredibly strong and long-lasting, able to withstand all the elements. Resulting in less worries about your deck fading or staining. 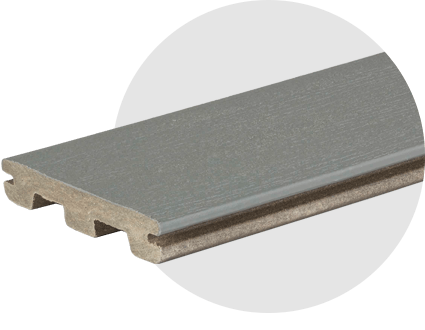 All of our dark grey deck boards are produced with the highest quality of materials, resulting in a 30-year standard warranty on all our decking! That's three whole decades where your decking will not rot, split or decay. Our dark grey decking range are available in various styles, perfect for a number of looks and designs. 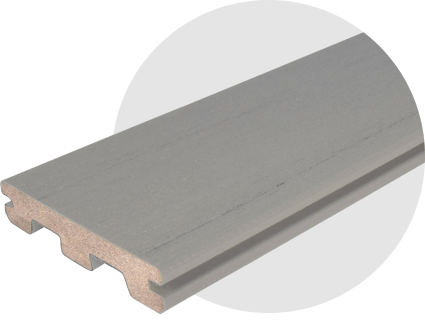 Choose between a linear wood grain, flat wood grain and grained capped with a fully protective polymer sleeve. 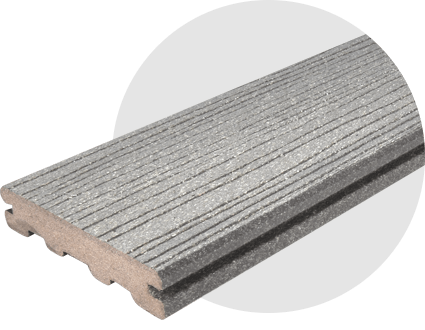 The boards themselves also vary, with two options for you to choose from: a non-capped wood polymer composite, or fully capped composite for an easy wipe-clean finish. Our dark grey boards come in two different styles, depending on how you would like them fastened: grooved and ungrooved. To meet all of your deck expectation, it is important to choose the correct groove.